ElcomSoft has recently announced the switch to OpenCL, an open cross-platform architecture offering universal, future-proof accessibility to a wide range of acceleration hardware. We’re actively using GPU acceleration for breaking passwords faster. No issues with NVIDIA hardware, but working with AMD devices has always been a trouble. So we jumped in, embedding OpenCL support into Elcomsoft Phone Password Breaker and Wireless Security Auditor. As an immediate benefit, we were able to add long-awaited support for AMD’s latest generation of graphic accelerators, the AMD Radeon™ HD 7000 Series currently including AMD Radeon™ HD 7750, 7770, 7950, and 7970 models. Headache-free support for future generations of acceleration hardware is icing on the cake. After switching to OpenCL, we further optimized acceleration code for AMD hardware, squeezing up to 50% more speed out of the same boards. This isn’t something to sniff at, as even a few per cents of performance can save hours when breaking long, complex passwords. AMD goes OpenCL. What about NVIDIA? Technically, we could have handled NVIDIA accelerators the same way, via OpenCL (it’s a cross-platform architecture, remember?) In that case, we would be getting a simpler, easier to maintain product line with a single acceleration technology to support. However, we’re not making a full commitment just yet. While some of us love open-source, publicly maintained cross-platform solutions, these are not always the best thing to do in commercial apps. And for a moment here, we’re not talking about licensing issues. Instead, we’re talking sheer speed. 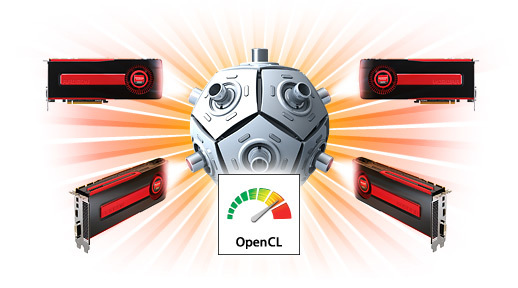 While OpenCL is a great platform, offering future-proof, headache-free support of future acceleration hardware, it’s still an extra abstraction layer sitting between the hardware and our code. It’s great when we’re talking AMD, a company known for a rather inconsistent developer support for its latest hardware; there’s simply no alternative. If we wanted access to their latest state-of-the-art graphic accelerators such as AMD Radeon™ HD 7000 Series boards, it was OpenCL or nothing. We didn’t have such issues with AMD’s main competitor, NVIDIA. NVIDIA was the first player on this arena, being the first to release graphical accelerators capable of fixed-point calculations. It was also the first to offer non-gaming developers access to sheer computational power of its GPU units by releasing CUDA, an application programming interface enabling developers use its hardware in non-graphical applications. From the very beginning and up to this day, CUDA maintains universal compatibility among the many generations of NVIDIA graphical accelerators. The same simply that can’t be said about AMD. So is it the “if it ain’t broke, don’t fix it” approach? Partly, but that’s just one side of the coin. CUDA simply offers better performance than OpenCL. The speed benefit is slight, but it is there, and it’s significant enough to get noticed. We want to squeeze every last bit of performance out of our products and computers’ hardware, and that’s the real reason we’ll be staying with CUDA for as long as it’s supported – or until OpenCL offers performance that can match that of CUDA. Did we make the switch half-heartedly? Nope. We’re enthusiastic about the future of OpenCL, looking forward to run our software on new acceleration platforms. But we don’t want to abandon our heritage code – especially if it performs better than its replacement! Intel Larrabee, AMD Llano: when? According to NordicHardware, Sapphire Or Zotac Might Launch Larrabee. No further information on Larrabee yet, though; as we already wrote, the Larrabee lauch date is set to 2010. The only news from Intel so far is about i3, i5, i7 CPU naming system: Lynnfield, Clarksfield, Arrandale, Clarkdale; besides, Intel plans shipments of 32nm ‘Clarkdale’ in Q4. What about ATI? Nothing really new so far; but here is some info on Llano chip; also, in AMD blog, and at Tom’s Hardware: ATI Stream: Finally, CUDA Has Competition. Hardware acceleration of password recovery has been a hot topic for quite some time already. We were the first to adopt widely available graphic cards for this purpose and we’re proud of this. Today I’d like to share some thoughts on hardware acceleration for password recovery, its past, present, and future. I will also cover the most frequently asked questions regarding GPUs. Considering a (new) AMD/ATI or NVIDIA video card for password cracking with Wireless Security Auditor or Distributed Password Recovery (to get the most from GPU acceleration technology — at an affordable price)? Read the Best Graphics Cards For The Money: May ’09 at Tom’s Hardware. I especially like the Graphics Card Hierarchy Chart. Finally, nVidia’s GT300 specifications revealed! 512 cores (remember that GT200 has only 240), which means about 3 TFLOPS — can you imagine that? We’re also expecting the new generation of Tesla supercomputers based on those GPUs. GT300 also gives direct hardware access for CUDA 3.0, DirectX 11, OpenGL 3.1 and OpenCL.